You hear the word ecotourism thrown around a lot. For some people, it means simply getting out into the open country. For others, it's an education on how to treat Mother Earth as gently as possible. The international ecotourism society defines it as "responsible travel to natural areas that conserve the environment and improves the well-being of local people." While there are several terrific tours in Puerto Rico, for travelers looking to reconnect with nature, you can't miss one of these ecotours. Coffee lovers, this one's for you! Take a tour of Hacienda Buena Vista; a 19th-century coffee plantation is a trip back through time to Puerto Rico's agricultural heyday. Guests have a chance to see one of only five working coffee plantations in the world that uses water power. Your guide will also show you the stone canals carved along the mountain trails. These canals channeled water to the mills used to grind the harvested beans to make coffee, of course, but also cornmeal. 15 Knots is your introduction to kiteboarding, a sport that might sound intimidating and complicated someone with no experience. The truth is, this is an exhilarating sport that you can enjoy with no previous experience, as long as you listen to Juan Carlos and his staff. The other way to soar with the wind is to hang glide above the canopy of El Yunque. Another sport that seems, on the surface, more intimidating than it is, hang gliding is a gentle sport that gets you as close to true flight as you can. If you're interested, contact the folks at Team Spirit. Surfing is not for the faint of heart, as you need a good deal of your power to stay upright and balanced, but that's all part of the fun. There are plenty of surfing outfits in Puerto Rico, particularly in Rincón and the west coast of Puerto Rico, but if you're in San Juan, Wow Surfing. Puerto Rico's bioluminescent bays, or bio bays, are among the most wondrous and unique natural phenomena the island has to offer. And fortunately, the tour operators take care to keep these natural resources healthy and long-lasting. Most bio bay tours in Fajardo and Vieques are kayak tours, with the exception of Island Adventures, which will take you to the Vieques bio bay on an electric pontoon boat. Ziplining has become an eco-tourism mainstay. After all, while you're flying through the air suspended by a cable, your environmental footprint is pretty small. Puerto Rico has its share of zipline parks, but there are few that compare with Toro Verde, a zip-line park in Orocovis that is well worth the day-trip from San Juan. El Yunque is one of Puerto Rico's beloved natural treasures, a gentle rainforest with no menacing flora or large, predatory fauna. But there is nothing gentle about the action-packed tour that Rossano and his guides offer at Aventuras Tierra Adentro. As you hike, rappel, climb, swim and scale your way up and down the mountain, you'll enjoy the more extreme side of ecotourism. If you're up for the challenge, you'll have a blast doing so. Hiking and walking around Puerto Rico's beautiful terrain beats driving any day. 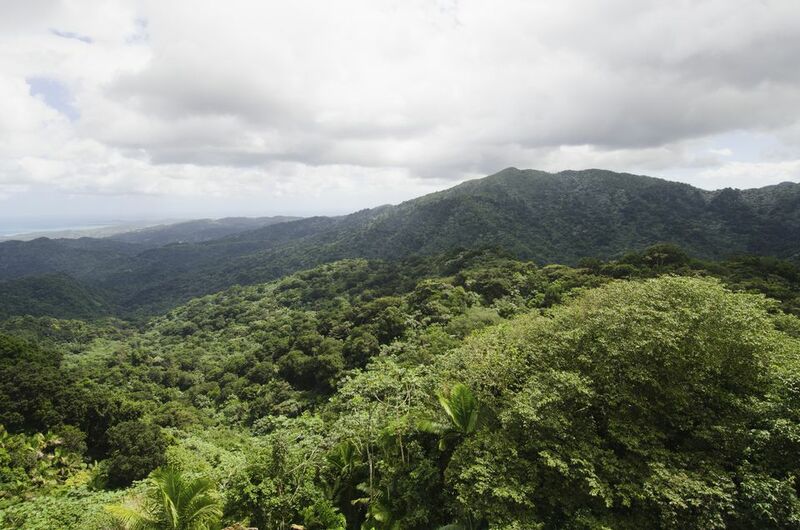 And while some hikes require a bit of driving to get to, the pleasure of walking among the verdant foliage of El Yunque or the unique landscape of the Guánica Dry Forest are completely worth your time. There are many tours that offer walking and hiking tours, both in San Juan and in the island's interior, and one very reliable option is Legends of Puerto Rico. You'd be hard-pressed to find a more eco-friendly marine vessel than a kayak. Small, sleek, and without a motor, it's a surprisingly relaxing mode of transportation with just you and your paddle. Kayaking is a popular pastime in Puerto Rico, and you can find tours that will take you out into the ocean, lakes, bays and lagoons all over the island. No matter where you are in Puerto Rico, you won't be far from a kayak with your name on it. Birdwatchers have long known that Puerto Rico is a destination worth visiting. Whether along the salt flats of Cabo Rojo or a birdwatching tour of Old San Juan, you'll be able to observe your feathery friends in peace. Evolution is a slow process. When undisturbed, it produces artistic masterpieces unlike anything man can create. Take the Camuy Caves, a millennium of nature's landscaping has produced a subterranean wonderland of stalagmites, stalactites, rock formations and sediment deposits. A walking tour of these incredible caves is a chance to watch how nature molds its canvas.